March 2013 | In an effort to boost ridership on its high-speed rail system, French national rail operator SNCF has launched the world’s first low cost high speed rail travel. Called Ouigo (as in “We Go”), the new cheap, no-frills train service for France will offer ticket prices from just EUR 10, significantly cheaper than tickets for the normal TGV train. Ouigo is an independently run subsidiary of SNCF and will operate its own trains, modified double-decker TGV Duplex trains, the same trains as SNCF’s regular TGV service. The new service will start running between the outskirts of Paris and the south of France (Lyon, Marseille, Montpellier) in April this year. Three or four return journeys will operate every day. To allow for such cheap fares, Ouigo shares similarities to no-frills carriers such as Ryanair and easyJet. Trains depart from Marne-la-Vallée (where Euro Disney is located) to the east of the French capital – almost 20 miles away from central Paris, a scenario reminiscent of the budget airlines’ strategy to use airports away from city centres. Ouigo trains will have no premium section, no food or drink service and less free leg space in order to accommodate 1,200 passengers, 20 percent more than a normal TGV service. Tickets can only be bought on-line, not from ticket machines or ticket counters. It also means adding fees. Passengers can bring only one small bag (about the size of an airplane carry-on) and a purse or backpack. If a traveler waits until boarding time to pay for an extra bag, there’s a EUR40 charge. If done ahead of time, the cost is only EUR5. Seating in a car with outlets costs an extra EUR2; getting information about a reservation via the phone requires another EUR1. Reservations can be changed for EUR10 (EUR20 if done on the phone), but not fully reimbursed. Each year 400,000 seats will go on sale at just EUR10 with a further one million costing just EUR25. Prices will rise depending on demand until they reach a maximum price of EUR85. 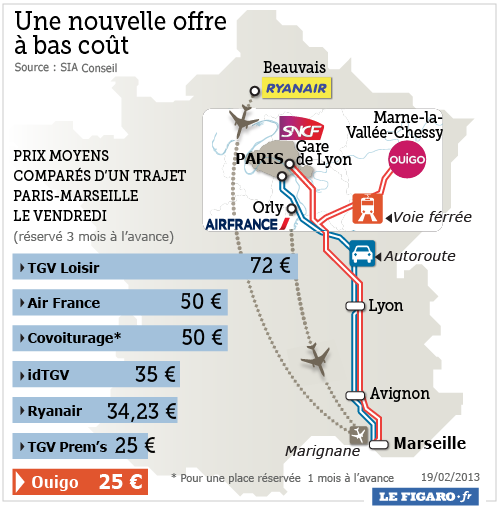 According to calculations published in French newspaper Le Figaro, the average price for a Friday journey from Paris to Marseille booked three months in advance costs EUR72 on the TGV, EUR50 on Air France, EUR34 on Ryanair, and EUR25 on Ouigo. Guillaume Pepy, the director of the SNCF, however says the new rail service is mostly aimed at the 4 million people living on the outskirts of Paris, who are more likely to take their car on long journeys but face France’s expensive road tolls and high gas prices. However Ouigo may also be considered by travellers on a budget, as it is just an EUR7.30 trip from the city center on the RER, Paris’ commuter rail system.